It’s nice seeing a vendor move through the stages of innovations through to transformation. HelloWorks caps that off for this eSignature player. Being based in New Zealand, but working with many organizations in the U.S., I was often required to sign and send faxes internationally. That is where HelloFax came in, it was a simple tool that allowed faxes to be sent digitally, without paying toll charges, no matter where they were going. Soon, however, faxing became a historical artifact, and HelloSign moved on to the broader eSigning opportunity, the service that I’ve been using pretty much since its inception. 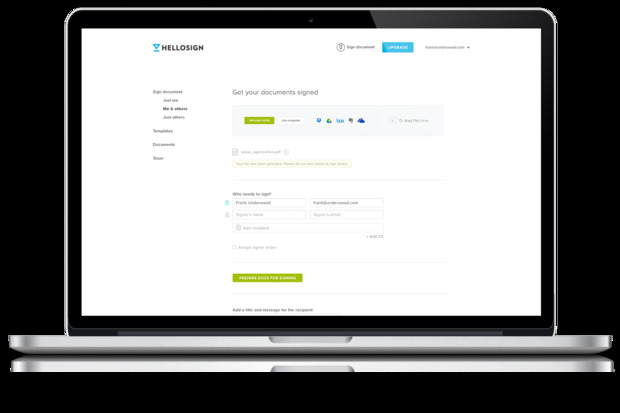 HelloSign rethought the lowly fax, digitized the entire document and enabled both form-filling and eSigning on the same platform. I use HelloSign all the time and it has been a huge time saver for me. But what would happen if you could not just fill in a static form, but actually wrap an entire workflow around documents -- what would that look like? HelloSign is ideating on that question with the launch today of HelloWorks, a new software platform that is designed to end paper pushing -- be it analog or digital. HelloWorks is a digital workflow product built on top of the existing HelloSign platform, but with an additional value proposition -- that of connecting related processes and tools into the document itself. The opportunity, and the need, are obvious. After all, many of today’s business processes rely on forms and documents in PDF format to gather information -- think business loan applications, new bank account openings, new hire onboarding, home purchases, and so on. These processes are typically high volume, directly relate to a business’ revenue stream, and yet are highly complex and error-prone. Inefficiencies and delays in these processes impact on the bottom line of organizations. In a past life I was involved in a number of small businesses that either extended credit to other businesses, or applied for credit from suppliers. The time and hassle involved in credit applications is significant, and is just one example of a business process that desperately needs to be redesigned. In the case of credit applications, one vendor that I’ve been mentoring in a New Zealand incubator, 1Centre, has started to focus specifically on this distinct vertical, but for more general business process situations, HelloWorks provides the extensibility and flexibility to tie in with different systems. This isn’t about simply putting a paper-based form online -- it’s about driving fundamental change in terms of the way these things work. HelloWorks makes both documents and workflows dynamic, changing the questions asked, experience presented and even documents used based upon real-time inputs. It allows information that was once stuck in static PDFs to flow into whatever systems, applications, and databases need it. HelloFax made my life a little bit easier and saved toll charges. HelloSign allowed me to give up on the concept of faxes and actually fill forms in completely digitally. But with HelloWorks, an entire realm of third-party developers and software vendors can embed processes deep into their organizations.